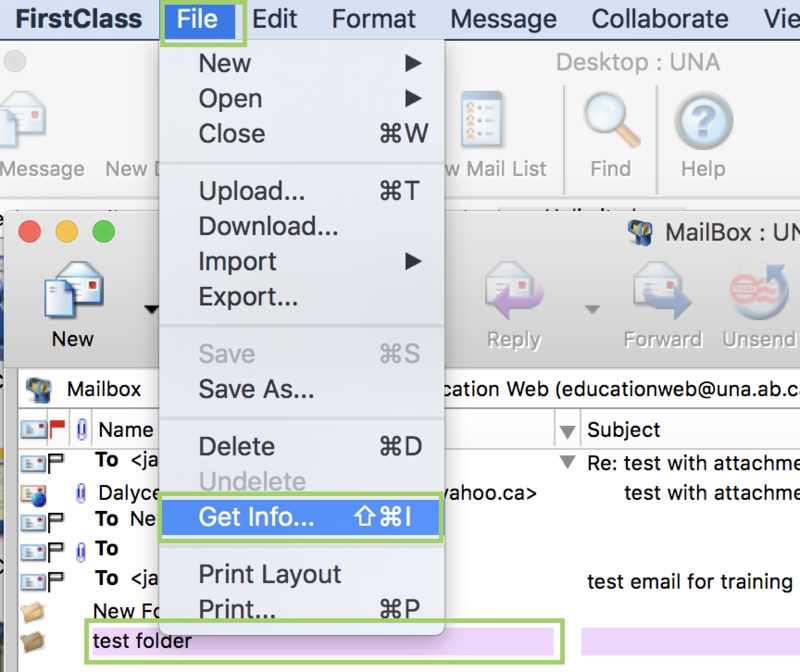 In Mailbox select folder by clicking on it once it will be highlighted in blue. There are two methods. From the FirstClass menu bar, click File, then click Get Info. A screen will pop up for allowing the name of the file to be changed. 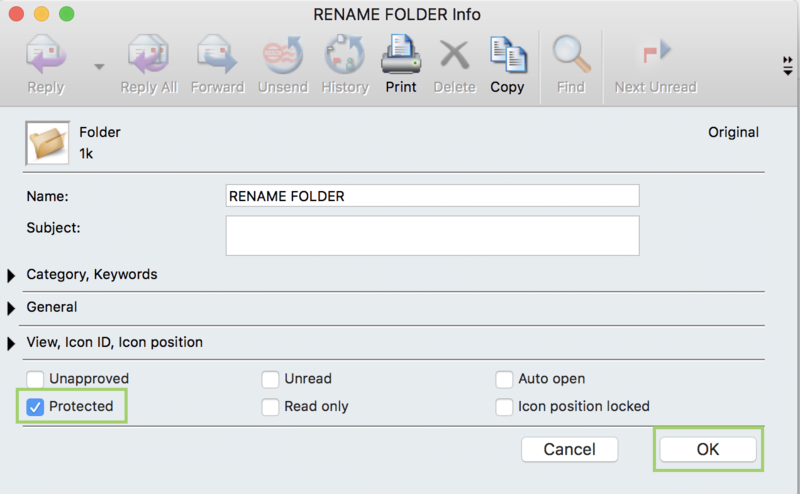 Enter new name of file in Name. Once changed click OK. Highlight folder and Right-click mouse button, then click on Rename. 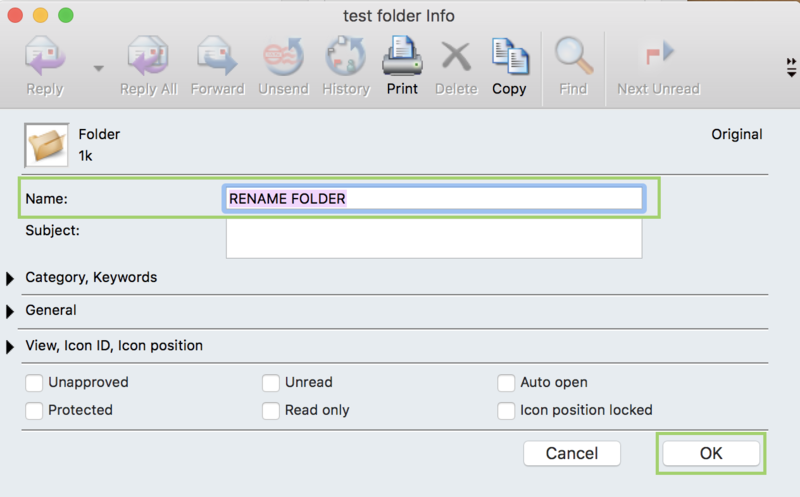 The folder will be highlighted and you can Rename the file. Type in the new name of the folder. Hit enter on the keyboard and the name has been changed. Options for viewing can be found on FirstClass menu bar View. View by Icon – icon size is to default. 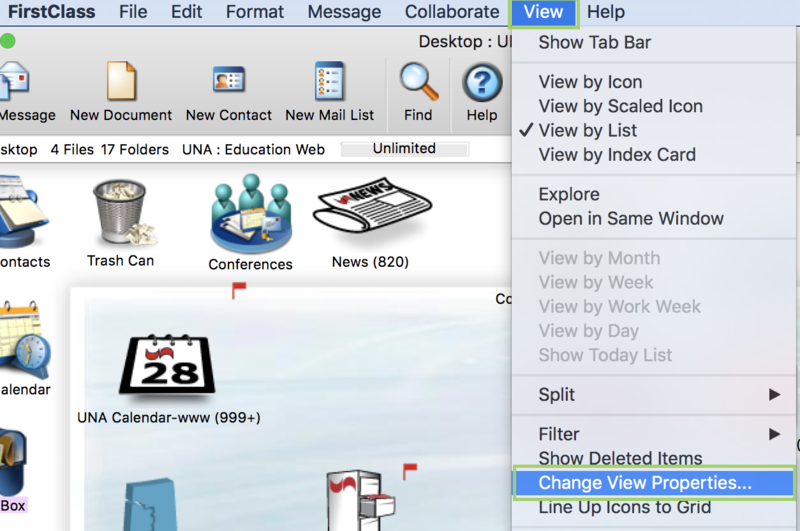 View by Scaled icon – gives control of icon size. 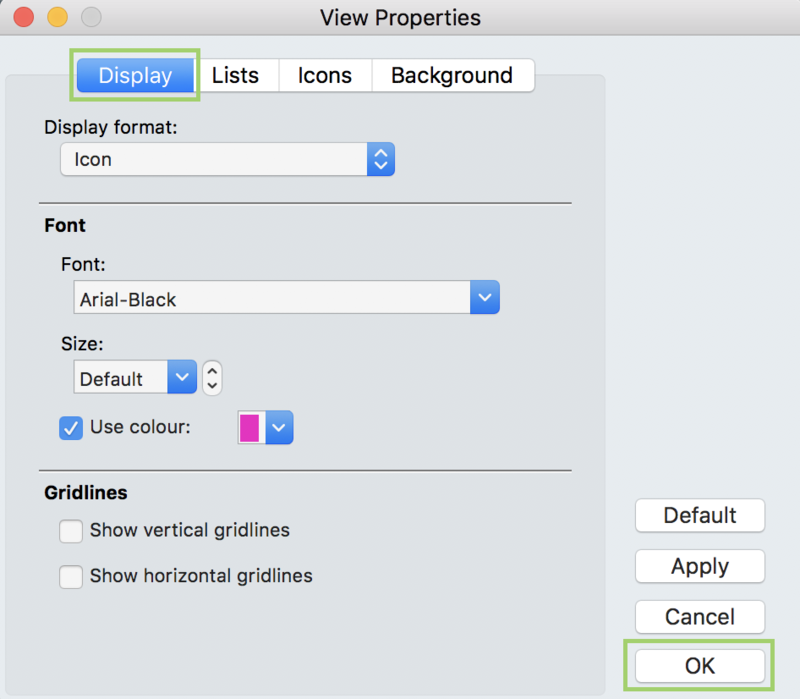 To change size right mouse button, click and click on Change View Properties. The View Properties screen will pop up. Click on the Icons tab then adjust size of Icons by moving the adjusting bar located in the middle of screen. Click Apply and OK to save changes. View by List – lists your messages (most common view). View by Index Card – shows the index card for each message. 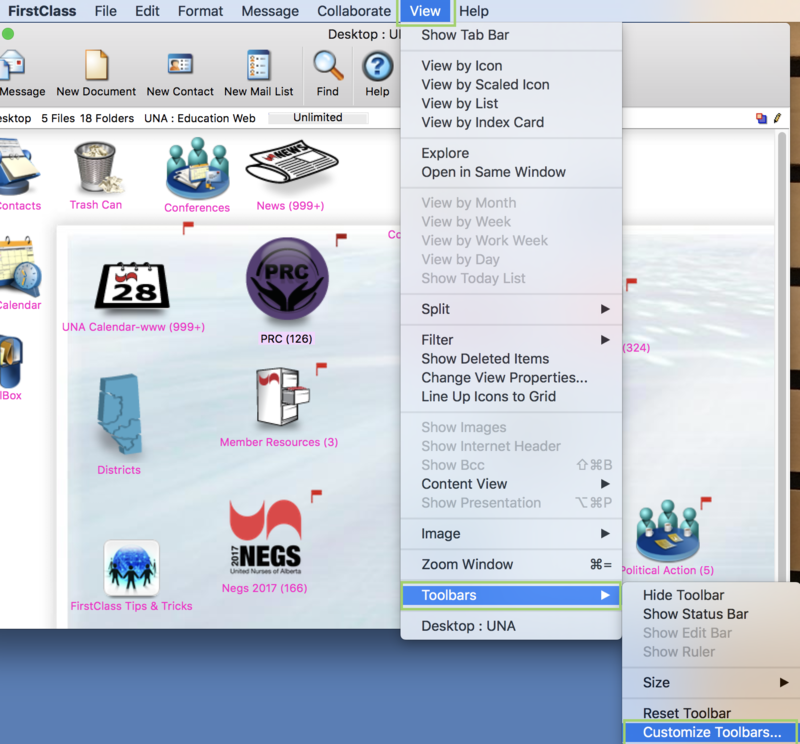 View by splitting screen – From FirstClass menu bar click View then Split and choose which one you want. 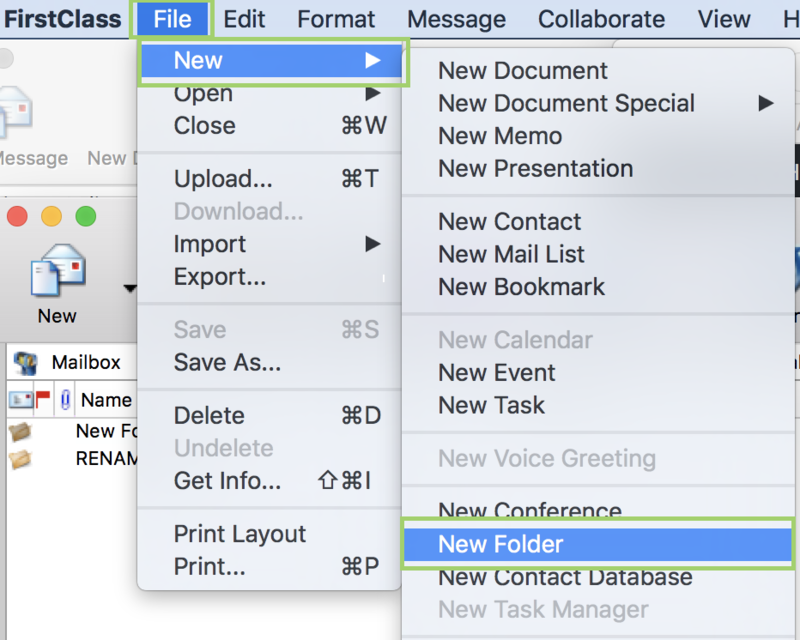 Vertical Split – files stored in folders on left and new messages arrive in Inbox on right. 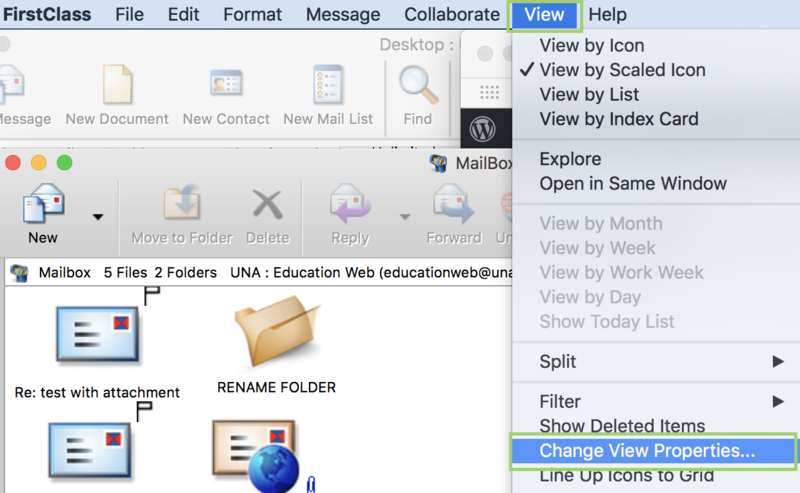 Horizontal split – files stored in folders above and new messages arrive in Inbox below. 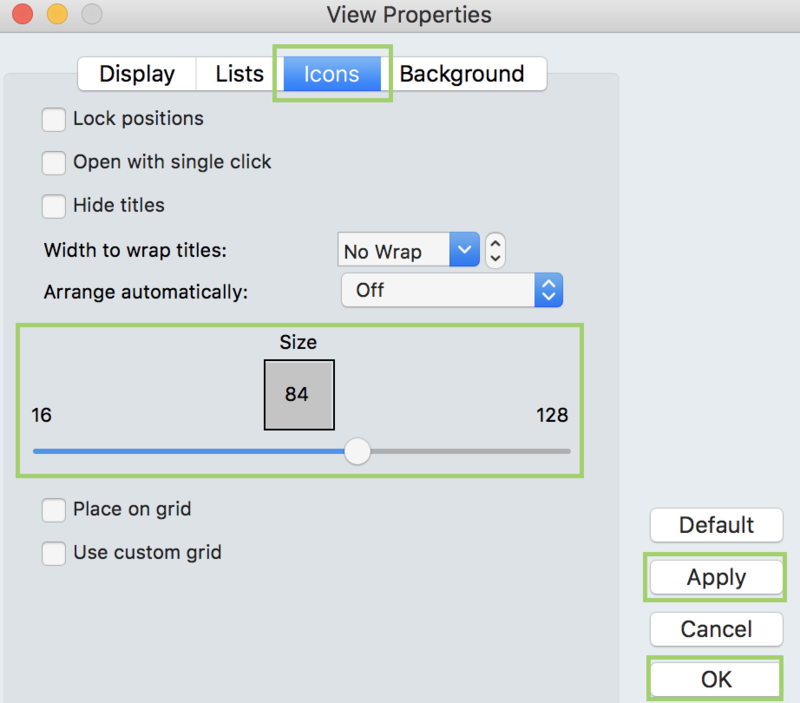 The Change View Properties feature provides access to controls for Display, Lists, Icons, and Backgrounds. Found under View, then click on Change View Properties. Display allows for personalization of the way the email messages are seen. The Font can be changed; the color of text can be changed by using the drop down menus. Once the changes have been selected click on OK. 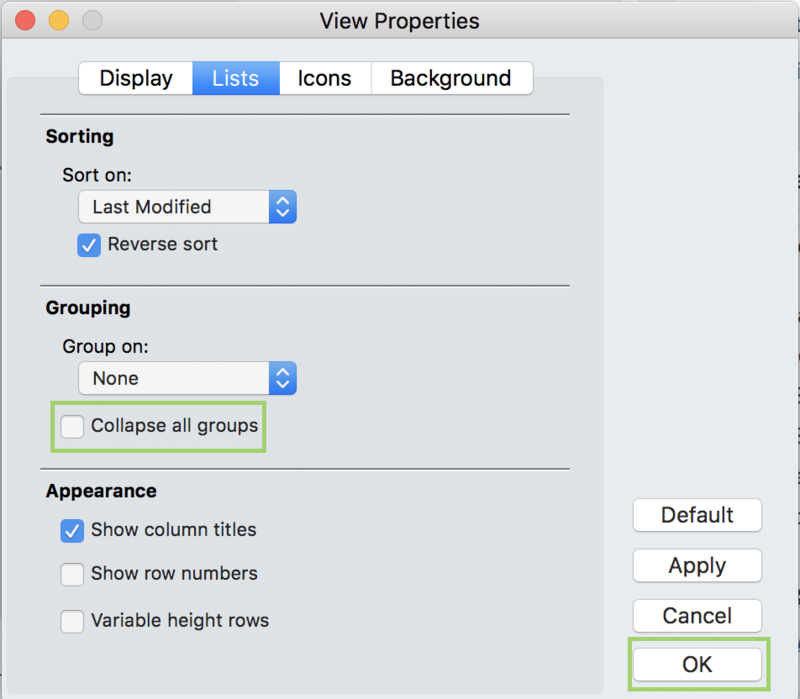 Lists allows for the the setting for Sorting, Grouping and Appearance. Changing the sort for a particular purpose is helpful. The sort might be left on Date Modified for most work, placing messages from newest to oldest. But if you need to locate a particular message from a particular person, change the sort to Name. Messages are now displayed alphabetically by first name. Grouping is a setting that groups messages together by Flag, Subject, Size etc. When messages are grouped, sorting by date or name is extremely messy and often useless. For most users, the best option is to Group by Subject. Do Not set the Collapse all groups as you will hide messages. Appearance is how you see the column Titles. When sending an attached file, be clear on the purpose of sending it. If you wish to share information only send the file as a PDF so that any viewer will be able to easily open and read. If you want the file to be able to be edited, then you and the recipient need to have compatible software to open and edit the file. 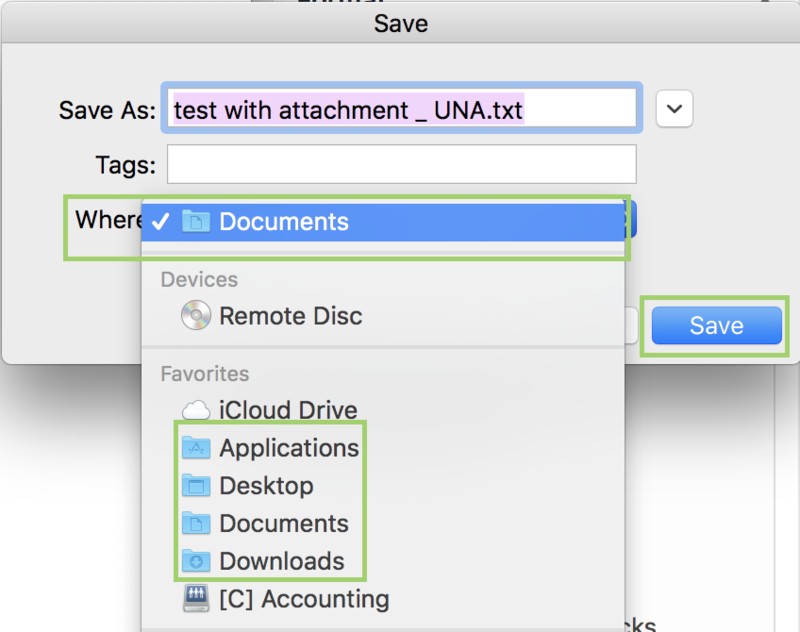 There are two methods to attach a file. Method One: Create a New message by clicking and dragging your attachment into the grey area at the top message. Your file that was attached will show by Attachments. Method Two: Create a New message and click on Attach and the Choose an Object screen will appear. Double click on the File that needs attaching or highlight and click on Choose. Method One: Open the message containing attached file. The attachment will be by the wording Attachments in the grey section of email. Click and drag the attachment to desktop of your computer. FirstClass will download it to your computer. Method Two: Go to FirstClass menu bar click, on File, then click Save As. The Save screen will pop up. Save As: Enter File name to be saved. 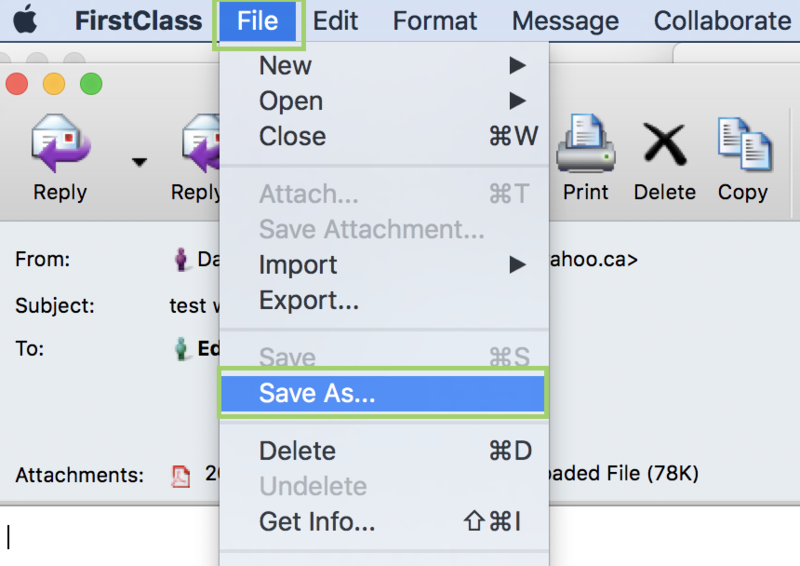 Where: Use drop down to choose where file is to be saved. File sharing is a two-way responsibility. Sender and Receiver need to work together to ensure files will open. The sender should indicate the file type in the body of the message. 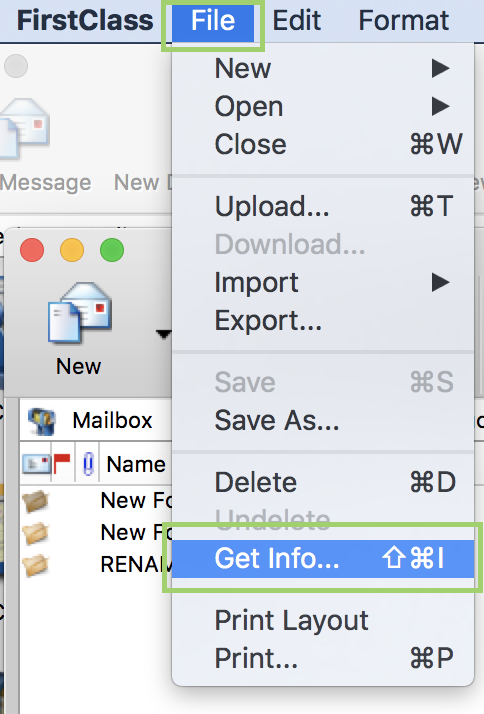 Double click on file icon. File will open with the correct program. Conferences are public forums for discussions and sharing information. Not every UNANet member can see every conference that exists. Each person is given access to conferences of interest and value to them. Some conferences are thought of as a library. Read the items that are of interest. Read items by particular people. Read items with subject lines that indicate content. On other conferences, read everything that is posted. Example: everything should be read on the District Conference and Local Executive Conference. When inside a conference, and the *new message* is chosen the message will be automatically addressed to the conference. Before sending any message, check that it is addressed to the correct person(s). Permission to receive the Local Executive Conference is automatically granted when you are named to the executive and removed once you leave the executive. For those on the executive who want to manually grant and remove permissions, please see Executive Tips and Tricks. Why does an Executive member need to receive Local Executive Conference? Your ### Exec Conference is your primary system for delivery of information on your local. This conference will be used by Membership Services to deliver updated information relevant to your local. This conference is used by Centralized Accounting to deliver updated statements to keep your local informed of the finances of the local. This conference allows you to send one message to all members of your Local Executive to help keep the communication simple and efficient. All executive members are responsible for keeping the local informed and working together to ensure that information is received and delivered in a timely fashion. The UNA Constitution includes direction that all executive members must access and read this conference on a regular basis. A signature should be attached to all email messages. The signature should include identifying information so the receiver can easily identify you and your location. 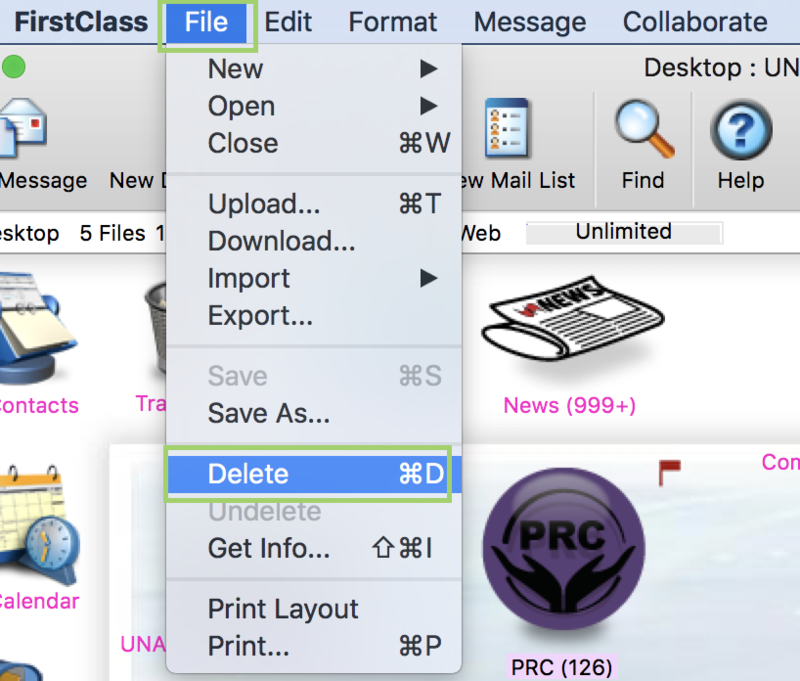 To create a permanent email signature, go to the FirstClass menu bar open FirstClass and click on Preferences. The Preferences screen will pop up. Click on Messaging, then on Initial Content. Type in your desired signature. Note: User can control typeface, font size, etc. Make sure to click in the box beside Add default signature to all new messages. Once the signature is complete click on Apply then on OK.
To create go to FirstClass menu bar and open FirstClass, then click on Preferences. 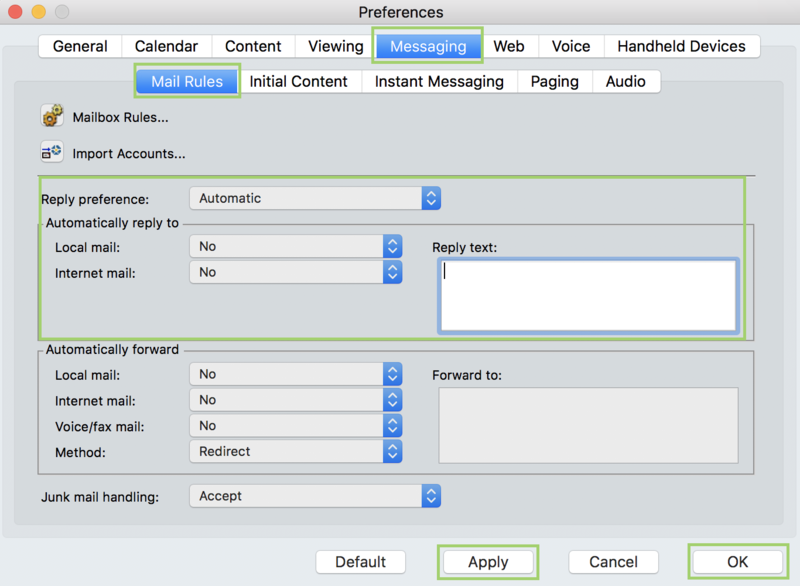 In the Preferences screen, click on Messaging then on Mail Rules. Reply text: Enter your out of office message. NOTE: Once you return to the office you will need to remove these setting. 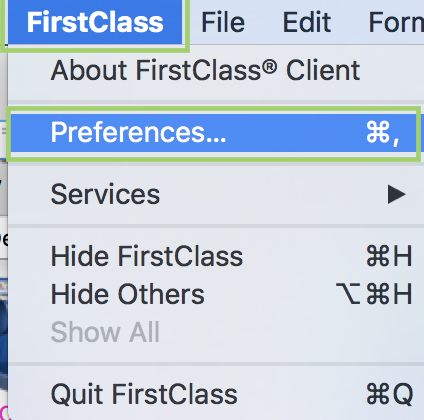 There are two methods to Find messages in FirstClass. Use the Find button on tool bars. The Find screen will pop up enter in Find what the search is for, then click Find. Use the FirstClass menu bar. Click on Edit, then on Find. A pop-up screen will appear for you to search in. The Find screen will pop up enter in Find what the search is for then click on Find. More Options for searching with Find. Find: This opens a field to allow a specific term to be entered and searched. Time Period: allows control over a set date range for messages. 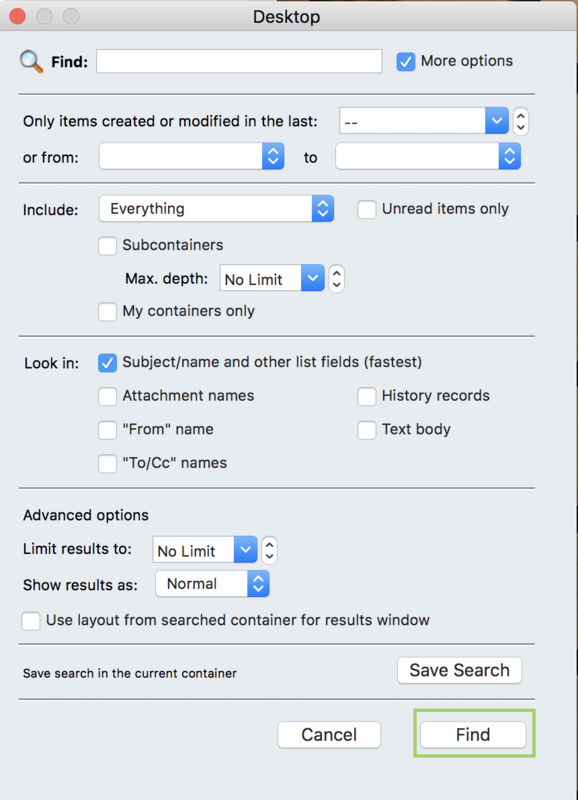 Include: Option tells FirstClass what containers/folders to include in the search. The default is set to include everything. 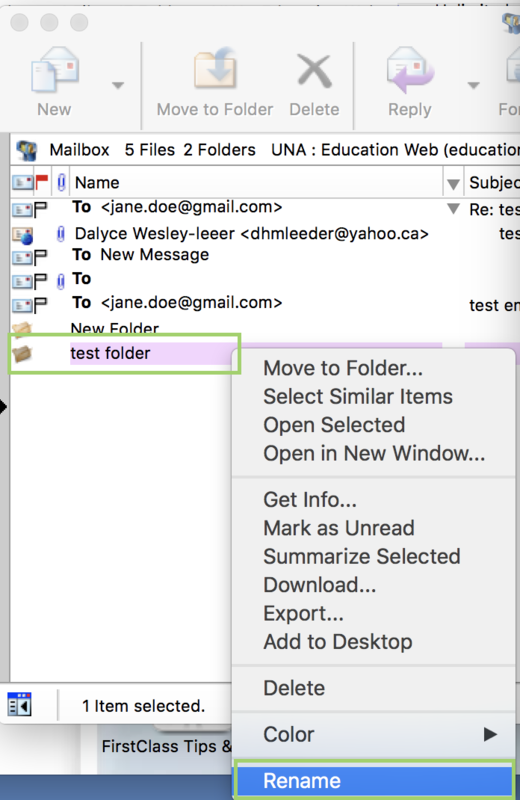 However, if you know the message you need is in a specific folder, open the folder before starting the search. The search is much faster this way. Look in: This option is extremely helpful since the default restricts the search to the Subject/name and other list fields. Adding one or more of the other options may slow your search but could also make the search results more accurate and useful. Advanced options: These often do not increase the value of a search, but you are free use them if desired. (EX: the ability to limit the search to X number of results. Save Search: Saves the results of the search to be used later if needed. 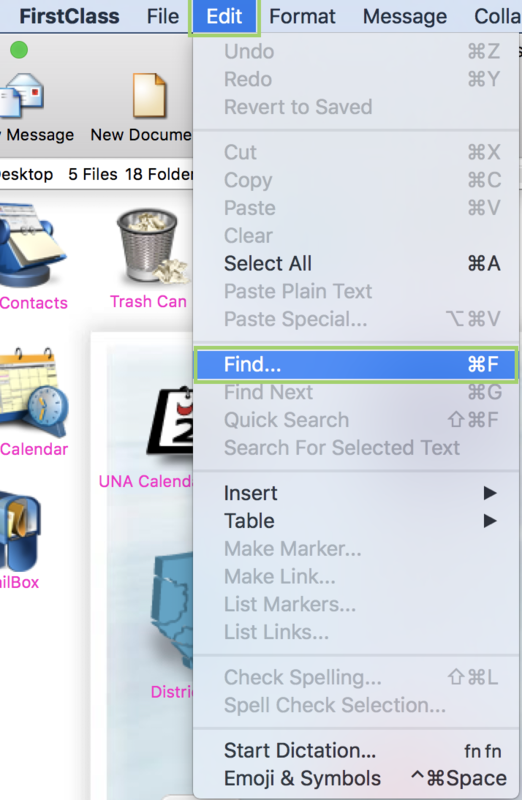 The results are identified with a magnifying glass icon and an identifying search parameter in the Name column of the folder where the search was conducted. Click on New then on New Mail List once the My Contacts screen opens. Name: Enter the name of new List contact. Click OK.
To add Personal Contacts into a list, click and drag the contact to the Members field. 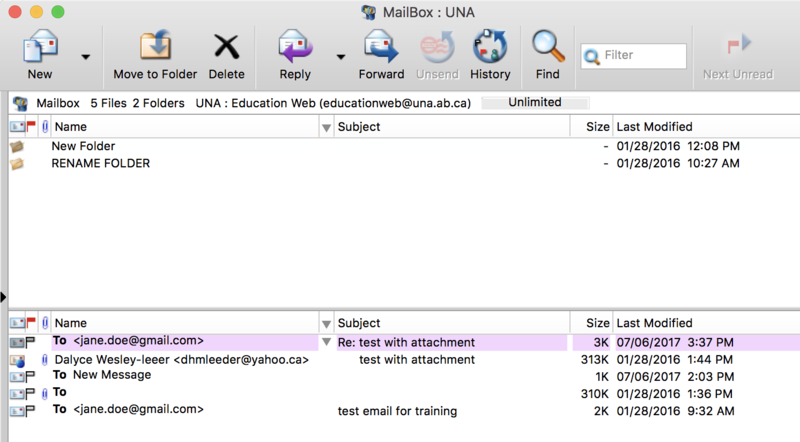 To add members of UNA to a Mail List just type their name as you would if emailing them and Tab on keyboard to populate their name. Please do not mistake the convenience of the Mail List option with the value of using a Conference. Mail List feature allows you to do bulk mailing. In this case one message is sent to multiple recipients. The message appears in the Conference folder and all members of the group have access to it. 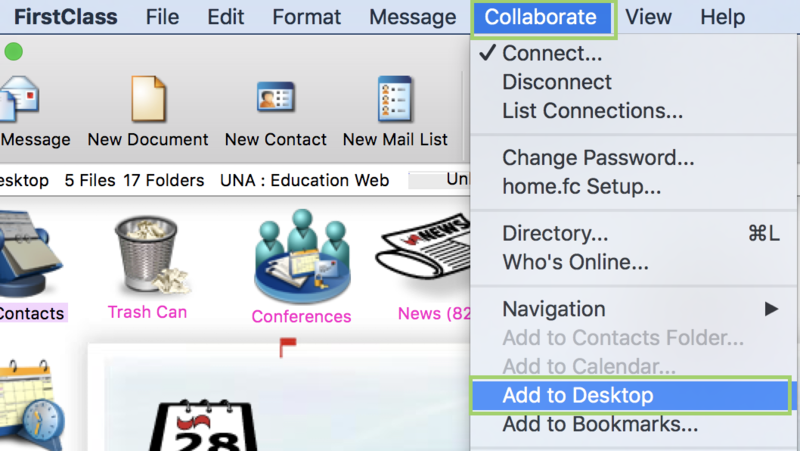 Create your message as usual, but use the conference name in the TO: field of your message. 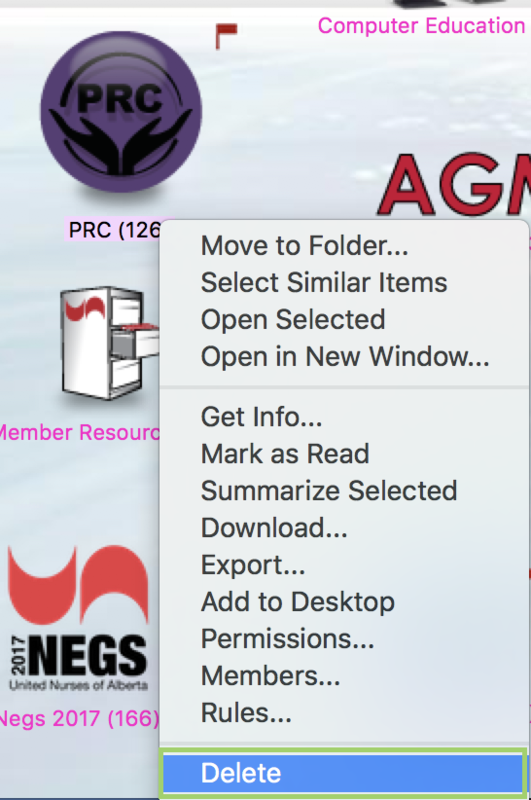 Some Conference folders open a pre-addressed message when you use the New Message button. When you send a message to a Mail List, a message is sent to each person in the list. Since many Conferences contain pre-addressed stationery as the New Message option, be careful to read the address of any message you create. If you have a read item in the District Conference but want to respond to just the person that posted the message, you will need to ensure that you correct the address. In this situation, use the Reply to Sender option. Two places in FirstClass store email addresses and other information about the individuals who use the UNANet system. The Directory is the place where all members of UNANet system are listed. 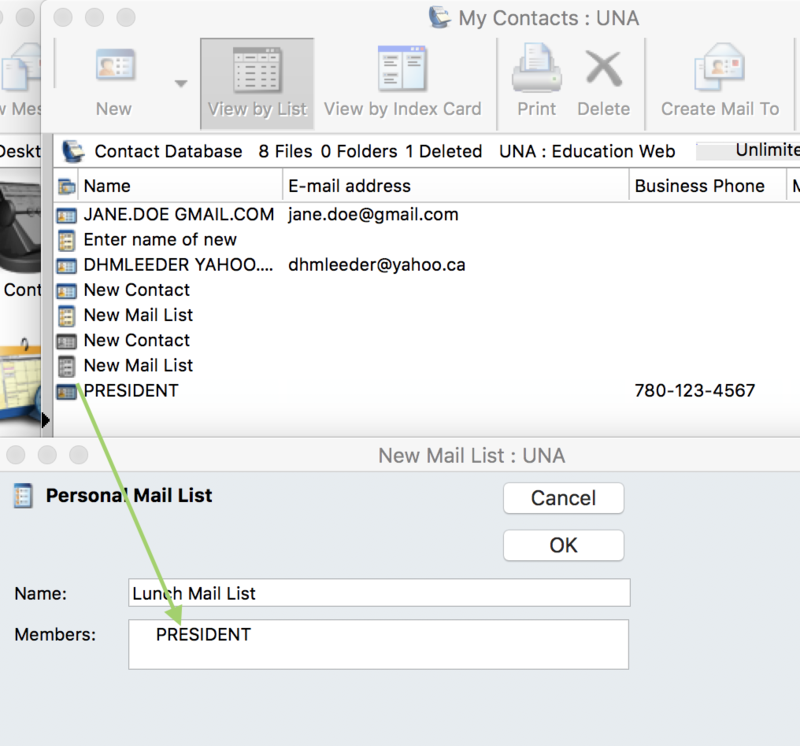 The Contacts Folder (or Address Book) is the place to add contact information about people outside the UNANET system. In addition, the Contacts Folder is a place to create mailing lists. 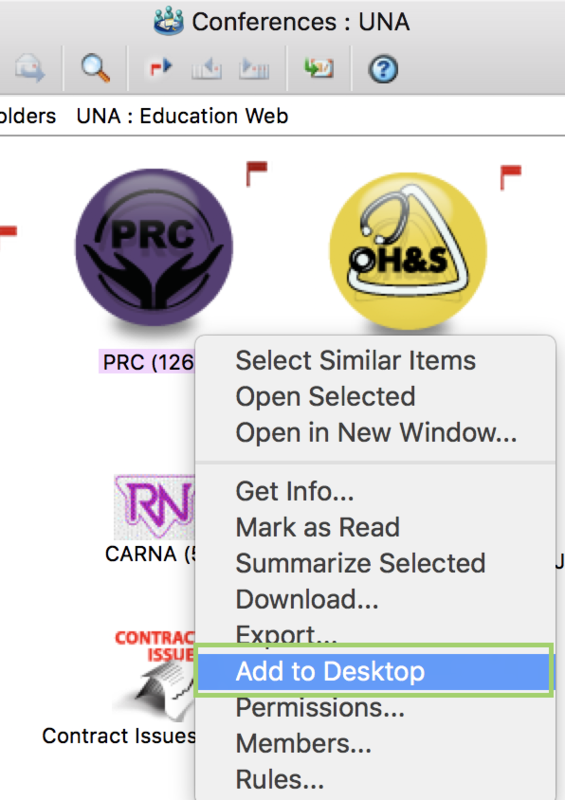 You can access these two resources using the buttons on the toolbar. Or, the Directory option in the Collaberate menu. Or, use Command-L. 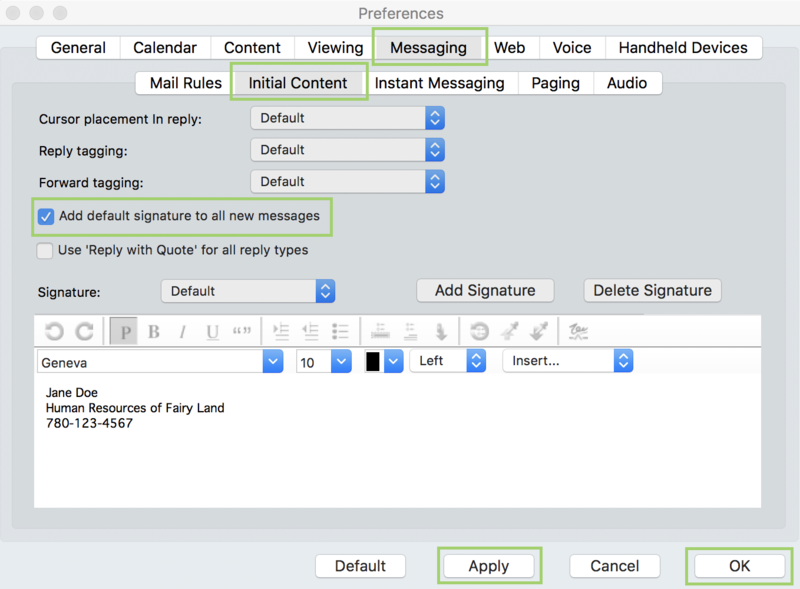 Shortcut the process by entering part of the intended recipient’s name and letting the software enter directly or give you a list of choices. You may also search by entering part of the intended recipient’s first name and last name. For example, “dav clim” will find only David Climenhaga, but “da cl” will find additional names.